A collection of character-specific short stories, Divided We Stand follows the exploits and adventures of a handful of former X-Men in the days following the group's disbandment. Beast, Magik, Havok, Forge, Moonstar and Surge capture the spotlight for just a few pages each in this double-sized anthology that examines the after-effects of Charles Xavier's apparent death and the overwhelming concept of facing the world alone as a mutant. Mike Carey and Scot Eaton open the issue with "Lights Out," a private peek at Hank McCoy's return to the site of Xavier Mansion following its destruction. While I've been critical of Carey's writing elsewhere in the X-Men universe, this is a complete about-face from that work… it's the kind of story he should've been writing all along. His take on the Beast is so captivatingly emotional that I was almost teary-eyed right alongside the blue furry scientist. While Hank reflects on the ruins of the building he spent the vast majority of his life assembling, Carey grants the reader a rare peek into the more mundane aspects of life in the mansion. As Beast mourns the loss of the simple classroom block he walked past every morning, we begin to understand a bit more about what life was like on a quiet day on campus. For this task, Scot Eaton's rich, elaborate artwork makes a great partner. His attention to detail translates the concepts that Carey had brainstormed, bringing them to life almost effortlessly. For a story so focused on introspection and old memories, there's an awful lot for the artist to visualize here, and Eaton performs magnificently. It's a pity that C.B. Cebulski and David Yardin's tale couldn't follow up with something along the same lines. In "Planting Seeds," the pair focuses on Illyana Rasputin, formerly known as Magik, sister to Colossus and an early victim of the Legacy Virus. Her story rambles on without point or purpose for six aimless pages before ending cryptically; promising a follow-up that I hope never comes to pass. It's an internal monologue, spoken aloud in Illyana's own little world, and it achieves little more than to remind us of the character's existence. Andy Schmidt and Frazer Irving follow that with "The Hole," which shifts the focus to Havok, and his adventures outside the Earth's orbit. Imprisoned deep in an alien ocean after fighting a losing battle against his brother Vulcan, Alex is on the verge of madness. It's a great premise for what promises to be an interesting new direction for the character, but Schmidt squanders the opportunity. Rather than examining Havok's new internal struggles, the whole of the story is wasted on a brief conversation between captor and captive, as Vulcan phones his bro up and basically fills him in on the plot points of Messiah Complex. It's a great setup, but never really gets a chance to get rolling, proving to be little more than a waste of some beautiful painted artwork. 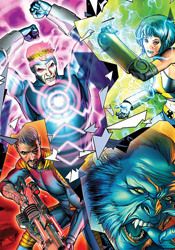 Finally, Surge and Moonstar are the subjects for C.B. Cebulski and David Lafuente's "The Sun Also Sets." As leader of the New X-Men, Surge has become a more assertive individual, but constantly struggles with the burdens that come along with her position. Here, she seeks out Moonstar for help dealing with the stress of that position, and ultimately gets little more than a feel-good pep talk out of it. Cebulski's heart is in the right place here, but so much of the story is wasted on hyperbole that I quickly found myself skimming for anything of substance. David Lafuente's manga-style visuals serve to give the tale an appropriate visual flair, but can only do so much with what they're given to work with. With the exception of Mike Carey and Scot Eaton's Beast story, Divided We Stand #2 is little more than a collection of throwaway tales featuring somewhat-familiar faces. With that one notable exception, none of these characters have been a member of the primary X-Men recently, and that gives the book a second-tier perception that it never manages to shed. These stories are all too short to really deliver anything of merit, but I doubt they'd be any more worthy of your attention if they were twice as long. Flip through this for the first story, but set it back on the shelves when you reach its conclusion. There's nothing really worth your time in the pages that follow.